Former England international Danny Murphy has criticised the victorious under-17 squad for being pictured with their shirts on back to front. 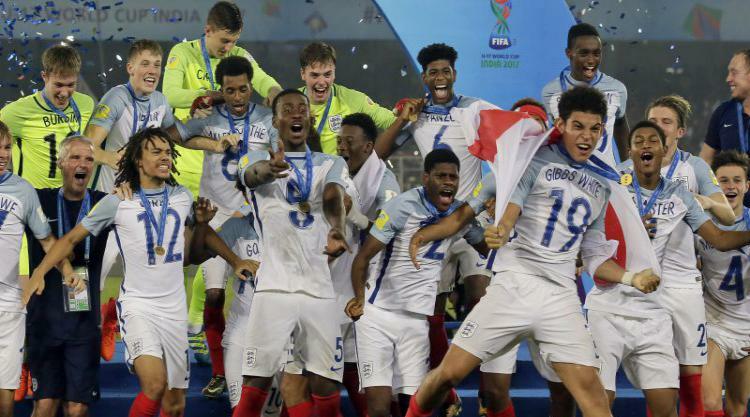 Steve Cooper’s Young Lions roared to World Cup glory on Saturday as they came from 2-0 down to beat Spain 5-2 in the final. They celebrated with the trophy by turning their shirts around to show their names, rather than the badge. Murphy, who won nine England caps and played for clubs including Liverpool and Tottenham, says the action showcases exactly what is wrong with the modern game. “There’s no England badge in the picture of them winning the World Cup – for me, that’s wrong,” Murphy, 40, said on talkSPORT. “They’ve all turned their shirts around because they want their names across their chests, so everybody across the world can see who they are. “They’re all saying, ‘I’m a good young player coming through, look at me’, but that in itself is what is wrong with society. “In effect, they’re thinking about fame as well as being a footballer and I think it creates a big debate here. But the England badge not being in that picture says a lot.